Who wants to be the new U.S. distributor for MIJ Tokai Love Rocks? There is some heavy reading in there. At last, common sense seems to have prevailed. Notch up one for the good guys, although I'm not sure there are "white hats" and "black hats" involved here like the old Hollywood westerns. Would look good on those "proto" Love Rocks, too, wouldn't it? Already pinged the powers that be to see how this will effect Tokai in the US. As Bart Simpson says in spanish translation...Mooolaaaaa! Hopefully I'll have more info after NAMM on how this effects Tokai in the US. 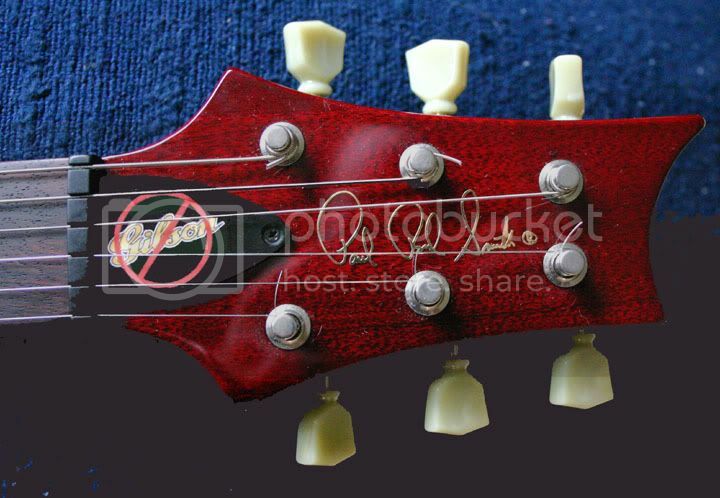 Most Gibson owners were very against this silly case by Gibson.You can go to many different forums and see how we ridiculed Gibson for this. However,why people are cheering for PRS,whose guitars are way to expensive too,is a mystery.No one won in the end. I don't really care for the PRS headstock shape. Maybe they should have ripped off the 'open book' instead of the LP body! Still, it would be good if Tokai were officially represented in the USA...if only so our American buddies have to pay tax on them at last! Thank you so much for your personal involvement in the case. And now Gibson has increased price 20% up, I really think they?re totally mad!